As a result of Foster’s resignation, the City of Danville has on its August 21, 2018, agenda, an action item to appoint Mr. Craig Davidson as member of the board of the Vermilion County Regional Airport Authority. His term will run until 2022. 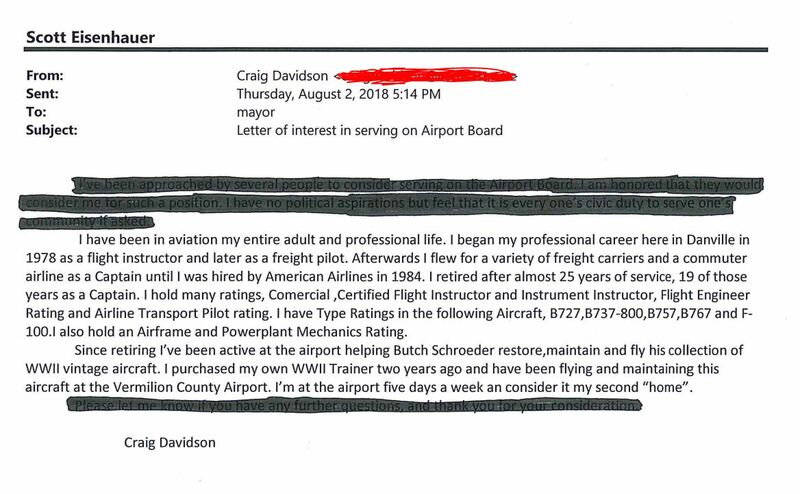 According to his emailed interest in the position, Mr. Davidson has 24 years’ experience as an American Airlines pilot, he was also a flight instructor and freight pilot. He retired from American Airlines almost 25 years ago having spent 19 years as a Captain. He has held ratings as commercial, certified flight instructor and instrument instructor, flight engineer rating and airline transport pilot rating, and an airframe and powerplant mechanics rating. You guys rock. Another one bites the dust. It is amazing how this yahoos cannot even read the laws they are suppose to enforce. Great work! Foster had to know he was wrong after reading the law and after you first brought it to the board’s attention. Glad he decided to resign before he was subjected to a citizens arrest and BEFORE adding further embarrassment to the airport authority. This next part is really sad. Keitzman is also a representative of DACC…so….. what do his actions really tell the community about his character and contributions he’s made to that school? This is shameful. The law is pretty simple and easy to read. – How could Keitzman swear in a new commissioner knowing himself to be a farce and in violation of Illinois Law? Is he totally without scruples and unable to read or comprehend Illinois Law? Why do the current board members allow this? They all should know better (and probably do). -This begs another thought. Why, why would any new commissioner worth his salt allow himself to be part of Keitzman’s dog and pony show? Obviously he hasn’t researched the law or he would make Keitzman’s departure a condition before becoming an airport authority commissioner. YE GADS….my sympathies to the Vermillion County Aviation Community. Is Steve Foster the one who responded with “a laugh” the first time he was asked to resign? ?